hands-on exhibits. These programs will be thematic and cover grades 1-12 in specialized units. Each program is conducted in one of our dynamic learning environments and lasts 35-45 minutes. Program capacity is 25 students and up to 10 adults. Explore the world of the Native Americans with our Sky Tellers’ stories about the beliefs about the stars from the Native American point of view. Learn how to make a corn husk doll and much more. Learn about all the different holidays celebrated throughout the year and throughout the world. Join us as we explore art and art forms from different cultures. We will have special art pieces on display and special art activities using recycled materials. Join us for a day of dramatic play with literacy, puppets, and costumes. Enjoy a fun-filled day learning about the Earth and some of its most important resources. Journey with us as we explore the world of astronauts. Learn about the moon, planets, and stars. 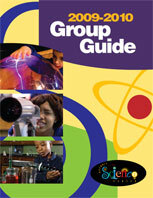 Click here to download our 2009-10 Group Programs Guide or call 313.577.8400, Option 5, for more information. Along with museum admission all programs will include the hands-on program and an IMAX® or Planetarium show of your choice. Shows are based on availability.